It’s Birmingham Alabama in 1962 and a twelve year boy with an unusual name is sitting at the back of his church doing maths homework while listening to the minister preaching. 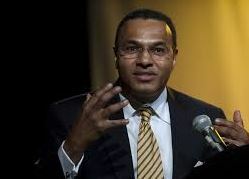 Even at that young age it was clear to Freeman Hrabowski III that he lived in a society which, because of his complexion, did not afford him the same rights and opportunities as others. But inspired by his preacher Martin Luther King Jr., he led a group of other children through the streets of Birmingham, against the fire hoses, against the police dogs and against the police chief Bull Connor. He led his group of underage activists all the way to the jail house where there would stay for five days. As we all know, Hrabowski’s country would overcome the evils of racial segregation and the nation would start the healing process. Freeman Hrabowski knew in very real terms the value of an education and took full advantage of each one of his hard-fought opportunities. Hrabowski graduated at age 19 from Hampton Institute with high honours in mathematics. At the University of Illinois at Urbana-Champaign, he received his M.A. in Mathematics and four years later his Ph.D. (Higher Education Administration/Statistics) at age 24. Since 1992 he has served as president of the University of Maryland, Baltimore County. Knowing from a tender age what it is to be on the winning side of history, Freeman Hrabowski uses his position as educator to make sure his country stays a winner. Over the last few decades the US has been losing ground in the field of education, particularly in maths and the sciences. The figures given by Hrabowski in his many lectures are disturbing. Less than a third of students who start of in maths or sciences will finish their studies, most will either change major or drop out altogether. The numbers are worse when considering only African American and Hispanic students and there are also huge discrepancies between the genders. Beyond the socio-economic factors, Hrabowski sees these trends as symptomatic of a failing educational culture. Students are not properly engaged; they are told early on what kind of student they are: that science just isn’t for them and as clichéd as it may sound, that mathematics isn’t for girls. Even before taking on the role of president of UMBC, Hrabowski fought to correct demographical discrepancies in education. In 1988 he co-founded the Meyerhoff Scholars Program which is open to all high-achieving students committed to pursuing advanced degrees and research careers in science and engineering and seeks the advancement of under-represented minorities in these fields. As President of UMBC Hrabowski does not settle for mediocrity, he demands excellence not only of his students, but also of his faculty and of himself. He has implemented major changes in the learning culture, particularly in the science departments. A major component of the studies of all students is learning through problem solving, real world problems supplied by private companies located on campus. This style of teaching is intended to engage students and to teach the principles of their discipline at the hand of practical implications. In 2008, he was named one of America’s Best Leaders by U.S. News & World Report, which in 2009, 2010, and 2011 ranked UMBC the #1 “Up and Coming” university in the nation. Having watched hours of talks given by Freeman Hrabowski, it is clear he has the best qualities of an excited inspiring professor, but it is equally clear that on stage and behind a lector stands a man committed to make a change. His style of rhetoric seems almost to be evangelizing; his passion, his punctuation, provoking audience response, evens the occasional corny joke. The parables he tells are about the students he meets on campus, or the story of his grandmother passing the literacy test and being able to vote. There are boundless clichés espousing the importance of learning, all of them true, but none comes close to articulating that importance quite like an educator with the infectious drive to make sure all his students succeed. One story that comes up quite a lot is that of orientation at UMBC. Students are told to look to the person to their left and to the person to their right, Hrabowski then states his mission – which is to make sure all three graduate.